« Video Sale – 10% off ! All of the books I have posted so far have been topical or relatively current books. Those aren’t my specialty though. Most of my books are folk tales, children’s books and poetry so my next few posts will likely reflect those interests. 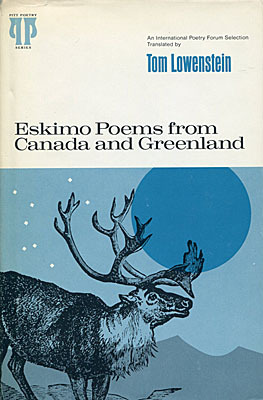 This book is one of the few books I’ve seen of Eskimo poetry. The poems are divided into chapters of “Songs of Mood”, “Hunting Songs”, “Songs of Derision”, and “Charms”. Printed by the University of Pittsburg Press in 1973. Buy this book from me on Alibris. You have featured one of my favorite books ever from the Pitt Poetry Series! Truly, you are doing a service to introduce people to it. to hold out in my hut. where I caught salmon once. Would I ever find firm ground? muttering spells as I went. If you’ve ever wondered about what Octavio Paz once called “the dark, forgotten marvel of being alive,” you owe it to yourself to buy this book.